Disclaimer: In some parts I’m going to keep things fairly simple. Let’s start with some basics. A DC (direct current) motor spins when connected to power. 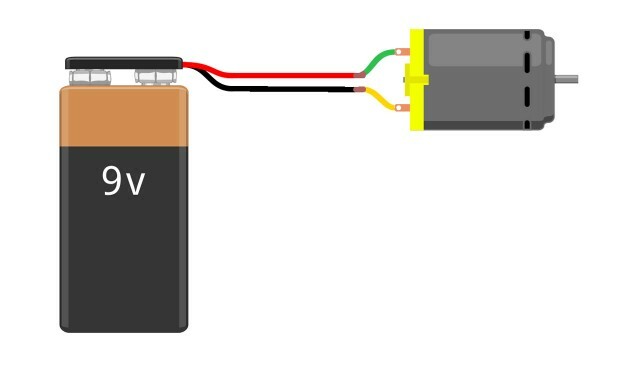 In the diagram above we’re using a small motor and a 9 volt battery. Connect them together and the motor starts to spin. If you flip the wires (as in red wire to yellow wire, and black wire to green wire) the motor will spin in the opposite direction. This is how “brushed” DC motors work. There are also “brushless” motors, but we won’t get into those. Here’s a motor controller. It has a connectors so you can connect a battery and a motor. You can’t make the motor go in reverse with this controller, but that’s okay for now. You can control the speed of the motor, but we don’t do it by lowering the voltage we do it by using “pulse width modulation”, commonly referred to as PWM. PWM is a method of controlling motors, lights, and other things by turning on and off the power really quickly. (Here’s a SparkFun article about PWM.) If you’re wondering why we don’t just lower the voltage (perhaps by raising the resistance) to make the motor go slower, read Why is PWM used to control DC motor speed instead of using a variable resistance? OK, so this motor controller comes with a potentiometer. When you spin the potentiometer is varies the resistance from 0 to 100K ohms. 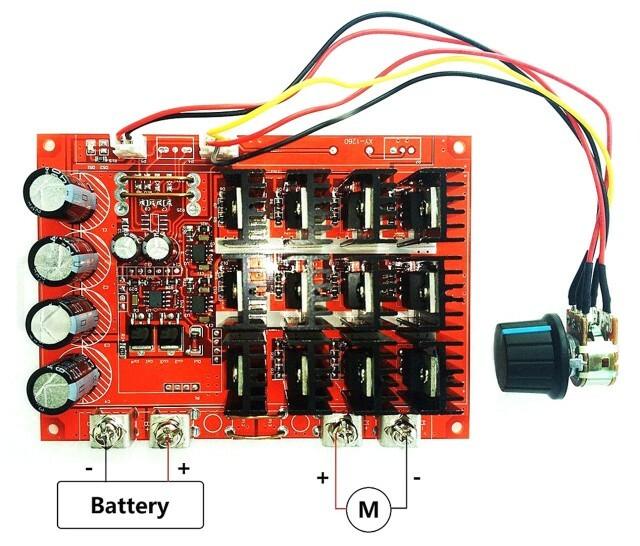 This get translated by the controller and feeds the appropriate PWM signal to make the motor go somewhere between not moving at all and full speed. The 100K pot also has two extra wires which work as a simple switch to turn the motor controller on and off. Before we move on, a bit more about this controller. It’s from China, and it’s really cheap. I only recently discovered it’s a “Leadrise” controller after someone provided this Amazon link. You can find these on eBay for under $13. (Damn, that’s cheap!) I’m going to focus on doing a low-cost build, so keep that in mind along the way. 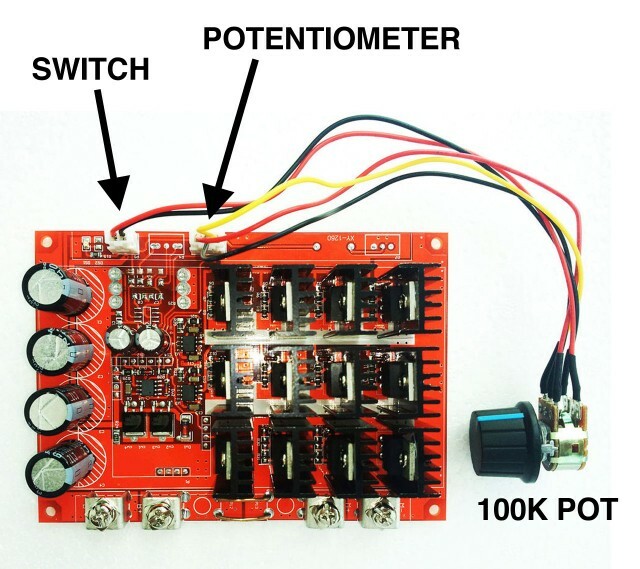 The 100K pot is a nice way to test the controller and make your motor spin fast and slow, but you aren’t going to want a little potentiometer on your electric vehicle! 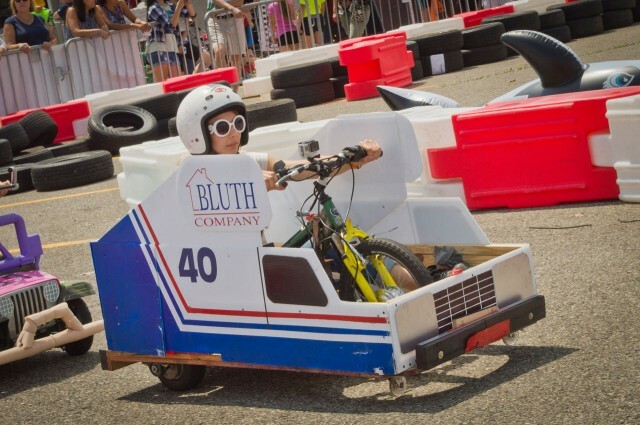 Let’s find a throttle. Now, motor controllers of this variety typically require a “0-5V” throttle, or a “0-5K throttle”. The good news is, the 0-5V throttles are really cheap, the bad news is, this controller requires a 0-5K throttle, which are not cheap. 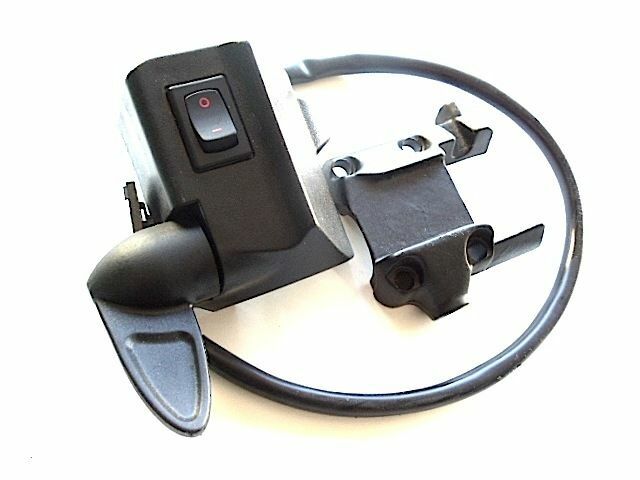 Magura makes a nice 0-5K throttle. You can find them for around $50 or so. There’s also a 0-5K thumb throttle that’s a bit cheaper. Any of these 0-5K throttles will work fine with this controller, and if you can decipher which wires are which you can cut off the 100K pot and wire in the 0-5K throttle. Easy, right!? In a future post we’ll get into connecting up the throttle, and after that we’ll look at adding in reverse, and eventually get into building our own throttle controller that will allow us to use very cheap 0-5V throttles with this controller. Posted on Sunday, November 13th, 2016 at 10:10 pm. Subscribe to the comments feed. Both comments and pings are currently closed. Post on your own blog.